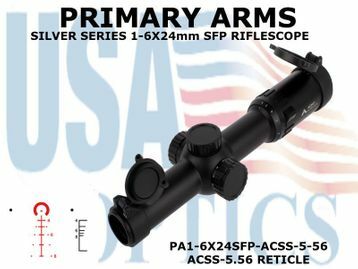 Primary Arms knew their flagship Gen II 1-6x24 would be a tough act to follow, so they worked hard to make incremental but real improvements. The Gen III is 18mm shorter (10.04in long), weighs 1.88 ounces less (16.9 oz. total), and has an additional 10 MOA of internal adjustment compared to the older model. The ACSS reticle has also been improved, now featuring a chevron center aiming point rather than a dot. Partial red reticle illumination is provided by a single (included) CR2032 battery, and a spare battery is included inside the windage turret cap. A total of 11 settings take the reticle all the way up to daylight bright. All lenses are fully multicoated for maximum light transmission and the 6063 aluminum body is Type II hard anodized in matte black.